I too have been looking. I want something that I feel is safe and well built. I have seen first hand the immediate aftermath of a failed trailer axle on the freeway...scary. -It's just big enough for my cart, yet very strong. -Its not unreasonably priced at $1,600. The next size up is a pretty big jump in price and gets heavier. The only downside I see (without knowing anything about trailers) is that at only 54 inches wide there won't be much space to step on after getting the cart onto the trailer. Just be careful You get what you pay for. I personally would never put my cart worth $$$$. on a $250 trailer, unless the insurance is outstanding and I was looking for my next cart. My camp neighbor gave me one of those folding trailers. I use it around the campground for taking garbage, leafs and such to the dump. VERY light duty. I use a cart to tow it. I would never put a cart on it that's for sure. I checked out those Lowes / Home Depot ones also. Welds looked shoddy and they just seemed light to me. Tractor Supply is the way to go OR a local dedicated trailer shop. I ended up getting a 1 ton trailer at a local shed / trailer place. American made. It's heavy. Understand, you WILL be putting more weight in it than you intend to at some point so might as well get something good. I, too, thought a light folding trailer wasn't enough trailer for hauling a cart. Admittedly, I have no first hand experience with this Aluma 5410T trailer, but have been cautioned to not go with one because it requires you to back your cart onto the trailer to balance the trailer to tilt back down upon loading. This, then requires you to also remove the windshield, if you have one, so it doesn't blow out at highway speeds. Instead, I purchased an Aluma 5410 BT, which I find perfect. Nice trailer , what did that run ? Nice trailer Wild Skies, I LIKE that trailer! 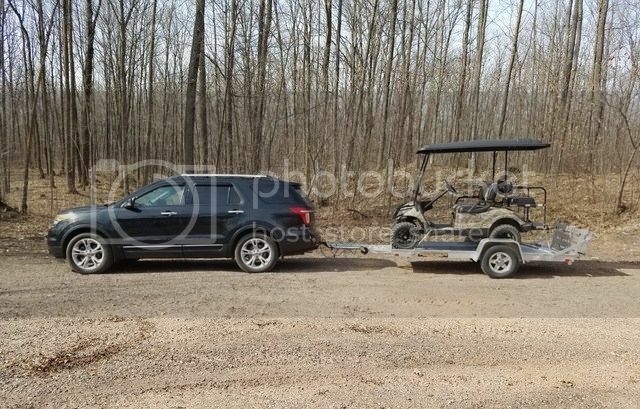 I bought the Aluma 5410 BT trailer from Goodrich Trailer Sales in Elk Mound, WI. I paid $1625.00 plus tax for it. This price was literally hundreds less than any other seller within 150 miles for the exact same trailer. Incidently, FluxCapacitor mentioned that the Aluma 5410T tilt trailer that he looked at was priced at $1600. Goodrich Trailer Sales has this same trailer listed at $1275 on their website . . . it pays to shop around. I might have to go with 5410BT also. I was cautioned not to purchase a tilting trailer by two different dealers. One was a UTV and Aluma trailer dealer in Antigo, WI, the other a golf cart dealer in Omro, WI. Like I said, I have no first hand experience with hauling golf carts on tilting trailers --- only recommendations by others.